Wednesdays are the busiest days at my house. It’s trash day, lawn-watering day (and with no actual sprinkler system, that makes me the lawn waterer), and vacuum/mopping day. Wednesday is also a day one of my strength training workouts falls on. And of course after that, I have to walk the pup 3 miles or he’ll drive me batty the rest of the day. Usually all these tasks are enough to wear me out. That’s why on Wednesdays, I make really easy, fast meals of fish. White fish cooks in mere minutes and served with a quick steamed veggie, means that I have dinner made in about 30 minutes or less. Yesterday, I had a sudden impulse to do some fall gardening, which really kept me busy. I put fresh, nutrient-rich soil around all my rose beds, and planted two Chapel Hill Lantana by the back porch. Needless to say, I had no energy to even consider a complicated dinner. I’m very glad I had already planned Lemon Sauced Dory for the menu. It’s quick, easy, tangy, and yummy. And did I say it’s quick? 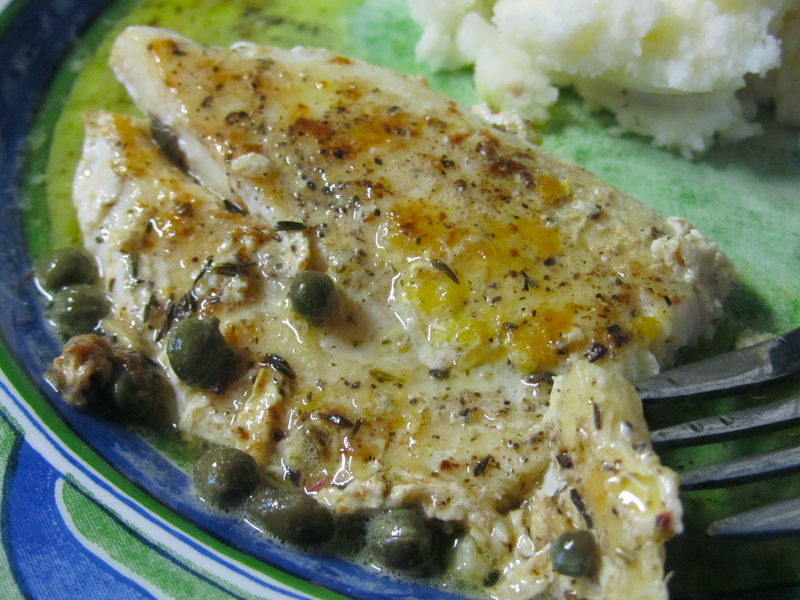 I can’t remember if I first this sauce on the back of a frozen fish package or where, or even if the measurements are the same as that first recipe I saw, but this is one of my favorite ways to have fish, with a lemony, buttery, white wine sauce poured over it, with bits of thyme and tangy capers. I keep bags of the Ore-Ida brand steam and mash potatoes in my freezer. They only take 10 minutes in the microwave, so in the time I made the fish, I also steamed the potatoes. I quickly mashed them with some butter and sour cream and in 15 minutes, we had dinner. And it was SO GOOD! I love having this quick and easy meal on our dinner rotation. 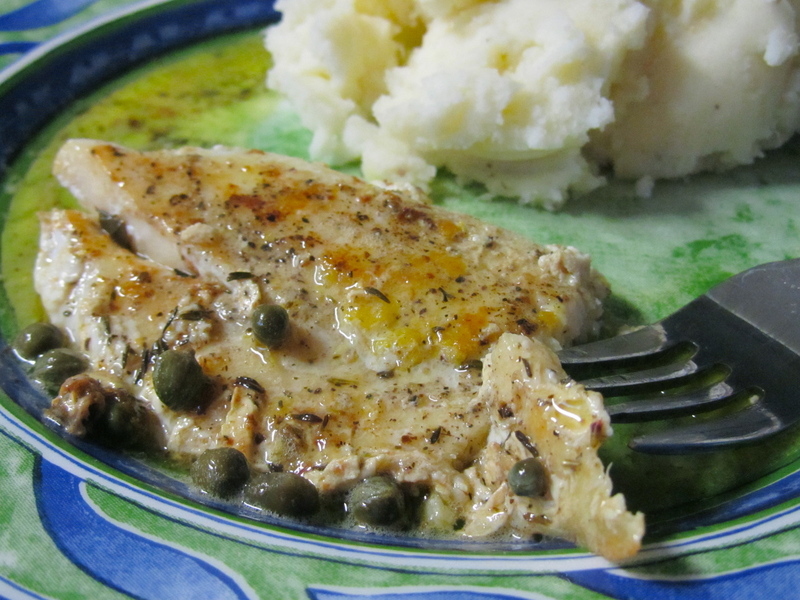 If your kids are fish eaters, they’ll love the lemony sauce. And the lemon zest cooked onto the fish really adds a pop of lemony flavor. Just don’t tell them it’s dory, or use another fish, if they’re sentimental to the characters in Finding Nemo. What’s your favorite quick and easy go-to meal to make when your day is too exhausting to think about more than take-out? I was very tempted to use the Subway coupons that came in the mail yesterday instead, but this dinner was faster than getting in my car to get the sandwiches.